"The Keys for Demo Cloud Automation"
An accessible self-service portal that offers a predefined catalog of demonstration can address many shortcomings and make life easier for both sales teams and prospective customers. By leveraging the maturity, scalability, maintainability and ease of use capabilities o­ffered by CloudShell, sales and marketing teams can ensure a sustainable competitive advantage. 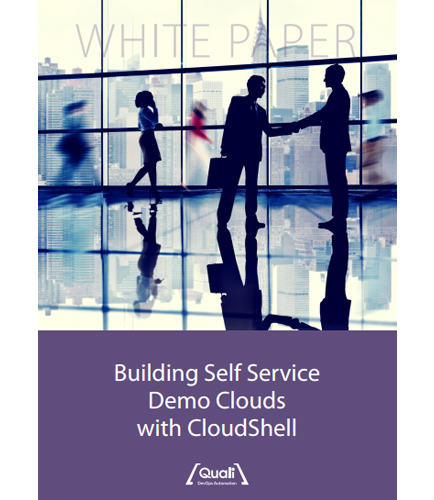 This whitepaper on “Building Self Service Demo Clouds with CloudShell,” provides insights on how self-service demo clouds helps to deliver the products and services faster to market with better quality. Although cloud computing has revolutionized the way we store and access data, the adoption of cloud computing is not free from issues and concerns. When planning a move to a cloud-based infrastructure, or a hybrid cloud infrastructure, you may not actually be packing boxes and folding up unused cables, but you should be getting ready for a change. Let’s explore some of the challenges and concerns you'll face as you move to a cloud-based infrastructure in this whitepaper. It highlights: The cloud is complex- Be proactive with performance monitoring in the cloud Data centers and clouds need a good connection- Evaluate performance management tools The cloud still requires monitoring- Cloud monitoring has to be continuous, Hence these are the top challenges of moving to the cloud that you should watch out for!